School supplies patiently sit in the backpacks waiting to be used. My pen – which will fill out and sign way too much paperwork – is selected and guaranteed to make this chore less painful. 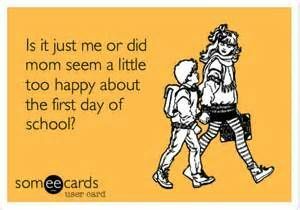 In our neck of the woods, school begins next Monday. But with Labor Day behind us, and summer math and reading assignments yet to be completed, this week is very much what I would think getting stuck in purgatory would feel like. AND because the kids are nowhere near the age of being left home alone – this Momma gets to take the week off from work. Can you guess? I am on Team SCHOOL CAN’T START SOON ENOUGH. Don’t get me wrong. I love summer, the great memories we get to create with the kids and I even relish that I get this last week to spend with them before they embark on their school year. BUT, (there is always a but) I am ready for school to begin. I excited to send them off to school. Off to normal routine schedules. Off to daily conversations with their friends. Off to daily activities that help their minds grow and nourish. On Facebook today, the teams are very much mixed. After the tears are shed and the pictures are snapped, it’s difficult to determine which team -Team SCHOOL CAN’T START SOON ENOUGH or Team PLEASE GIVE ME ONE MORE WEEK – is in the lead. So I ask you – which “team” are you on and why? I’m with you, but I am a little anxious about the first bus ride! But I don’t want to project my nerves onto my equally nervous Kindergartener. When both girls are in school and I can start up the 2013 routine, I’ll be very very happy! Ahhh the first bus ride – I could barely think clearly as my oldest boarded the bus for the first time! I held back the tears until the moment the bus pulled away. And a confession – I still tear up. Good Luck!